Have questions about which type of large gun safe to buy? Want to know what to expect with your purchase? Give us a call today and have us walk you through the steps! This extra large rifle safe has the storage capacity for 45 long guns on the interior and two on the door. 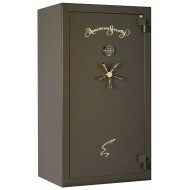 American Security offers high end security and fire protection with this rifle safe. For example, there is a 2" total wall thickness on all sides.....with poured DryLight insulation and two layers of steel. This safe has earned a Mercury Class III fire protection label for 90 minutes of fire protection. In addition it has 2 stage dual fire seals with silicone seal on the door jamb and an expandable Palusol seal on the door - these also protect the contents of your safe from fire. American Security has made the interior of this rifle safe both versatile and attractive. The rifle safe is lined with rich pin dot fabric and the back wall is mirrored. The interior can be configured to have small cubicles for other items such as pistols. With a heavy bolting system and anchor down floor holes, you can be assured that your large rifle safe will deter burglary of your firearms. This is a high end safe with excellent fire protection. It has earned a Mercury III fire protection rating for 90 minutes. In addition the door and door jamb have extra seals which expand in case of fire to protect the contents. American Security, with the BF7240 gun safe is offering great burglary protection. It has earned the California Department of Justice label for safe storage of fire arms and a UL Residential Security Container rating. Added security comes from the 11 massive 1 1/2" chrome-plated bolts. There are several features that make your long guns easy to access...there is a bolt detent system which hold the door open while you search your gun safe. There is also a mirrored back which gives you greater visibility and an E-Z Slant Out Interior for the barrels of rifles. To top it off, American Security has maximized the usefulness of your gun safe by fully using the door for storage. They call their storage system the Premium Door Organizer and it provides storage for two long guns, two pistols and many smaller items. This may be a once-in-a-life time purchase. Get the best in firearm storage today. This large American Security gun safe comes with a UL Residential Security Container Rating. It also has earned the California Department of Justice approval for the safe storage of firearms. 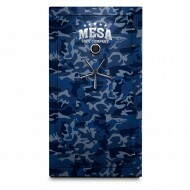 All the American Security BF gun safe series come with a Mercury Class II fire rating for protection up to 90 minutes. The door jamb has a silicone seal and the door itself has an expandable Palusol seal so in case of fire, there are additional barriers to protect the contents. This safe comes standard with a spy-proof, key locking dial combination lock which has a UL II rating for drill resistance. 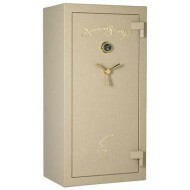 The interior of this safe is high end with a mirrored back wall, pin-dot fabric lining and the Premium Door organizer. Store your pistols, two long guns and other valuables on the door! When you reach in your safe to remove a long gun the E-Z Slant-Out interior provides easy access. 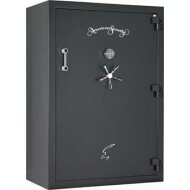 The AMSEC BF6030 rifle safe provides superior fire and burglary protection. AMSEC is so sure of the high quality of this rifle safe that it offers a Lifetime Warranty for repair or replacement after damage from an attempted break-in or fire. You can configure the rifle safe interior to meet your needs. It can hold up to 25 long guns in one configuration and in the other configurations you can create shelves for smaller objects. With its high security features plus 90 minute fire protection, you will want to use this safe not only for firearms but for important papers and other valuables. AMSEC has prepared this rifle safe for a plug in dehumidifier in case you live in a humid environment. If you need indoor delivery for this 760 lb safe, please call 1-877-442-9964. There is an extra charge. 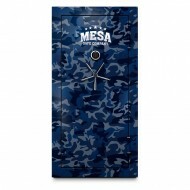 Along with a great interior this rifle safe comes with a 60 minute fire protection rating. If you need indoor delivery for this 706 lb safe, please call 1-877-442-9964. There is an extra charge. The 12-gauge steel body of this rifle safe has storage for up to 28 long guns with room for two more on the door. If you don't have that many long guns, this rifle safe can be configured to hold 14 long guns with shelves set up for store of pistols or other smaller valuables. American Security has introduced its Premium Door Organizational system which includes additional storage for two pistols, two long guns, and other small objects and papers. Along with its great capacity for storage, the SF6030 rifle safe has a completely veloured interior. This product has been tested and earned a Mercury II label for one hour fire protection.